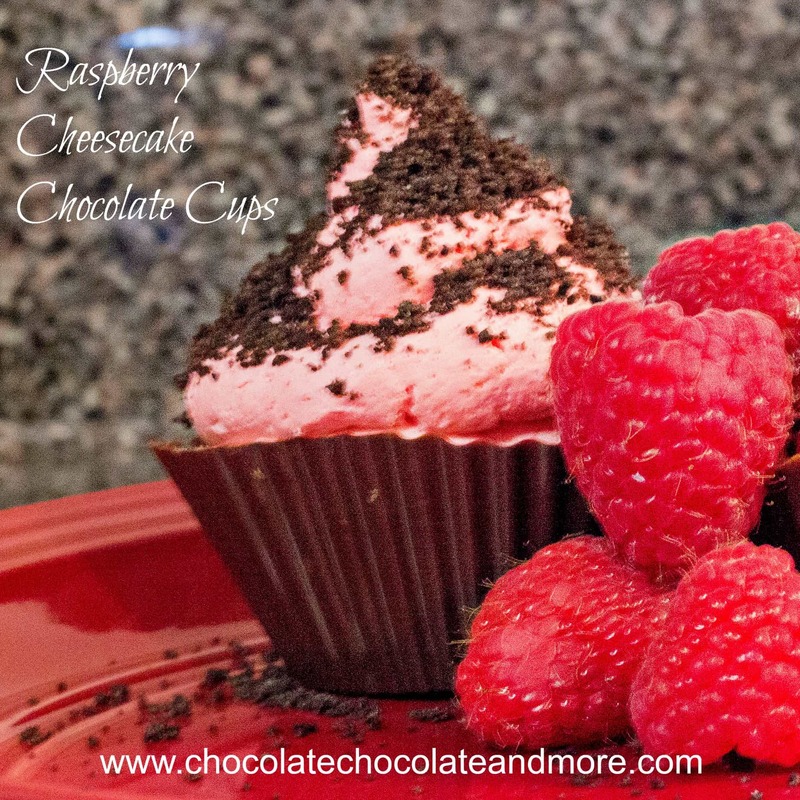 Easy Chocolate Raspberry Charlotte - Chocolate Chocolate and More! 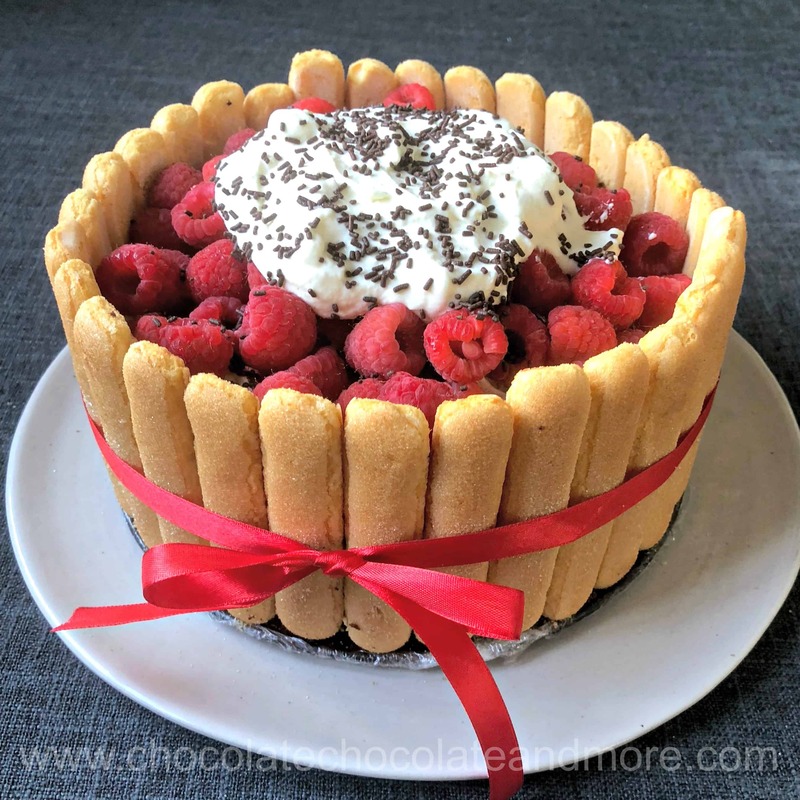 Easy Chocolate Raspberry Charlotte starts with a sponge cake, surrounded by lady fingers and filled with chocolate and raspberry pastry cream. 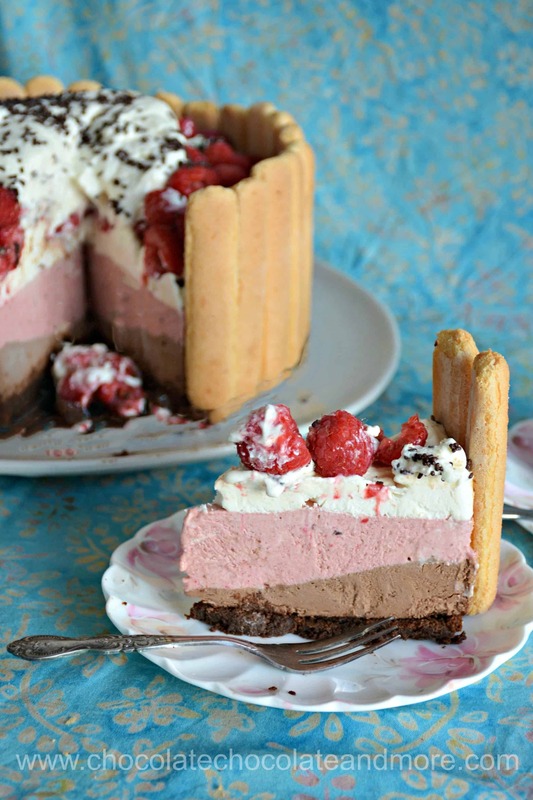 Top it with homemade whipped cream and some fresh raspberries for an amazing treat. My birthday was last week and I really wanted to try something new. I tried to make a charlotte when I was in high school and failed miserably. I haven’t tried since so this was the time. So I know you’re looking at this and thinking, “Easy? Is she kidding me? She failed the first time.” With a few tips and some of my streamlining, you’ll find this is much easier than it looks. This time I watched a for some tips. If you’ve ever made a sponge cake, homemade pudding and whipped cream, you have all the skills you’ll need to make this. If not, don’t worry. None of those things is hard to make. The trickiest part of making this is lining the pan with your sponge and the cookies. The first 5 minutes of the culinary school video show how to do this. The key is to line the pan with plastic wrap first. I didn’t know this the first time I tried to make a charlotte. I lined an Angel Food pan with sponge cake and poured mousse in. And then it all leaked out in the refrigerator. What a mess! My lady fingers weren’t too rounded so I didn’t cut the ends off like in the video. I just gently lifted my sponge cake and tucked the ends of the lady fingers in. The sponge held the lady fingers up while I made the filling. I’m a minimalist when it comes to clean up. The fewer bowls the better. So I made one batch of custard for the two flavors. I poured half the hot custard over a chocolate bar to make the chocolate custard. I added seedless raspberry jelly to the half left in the pan. That leaves just whipped cream. I whipped up one batch of unsweetened whipped cream and folded half into the chocolate custard and the other half into the raspberry custard. After you pour the two custards into the lined pan you could to get fancy by swirling them together with a knife. I was going for easy so just left the layers. I put the ingredients for the sweetened whipped cream into the bowl I used for the unsweetened whipped cream. It’s really hot here so I made a stabilized whipped cream. Stabilized whipped cream has some gelatin in it to keep it from deflating in the heat. You can use Cool Whip if you want to save time. 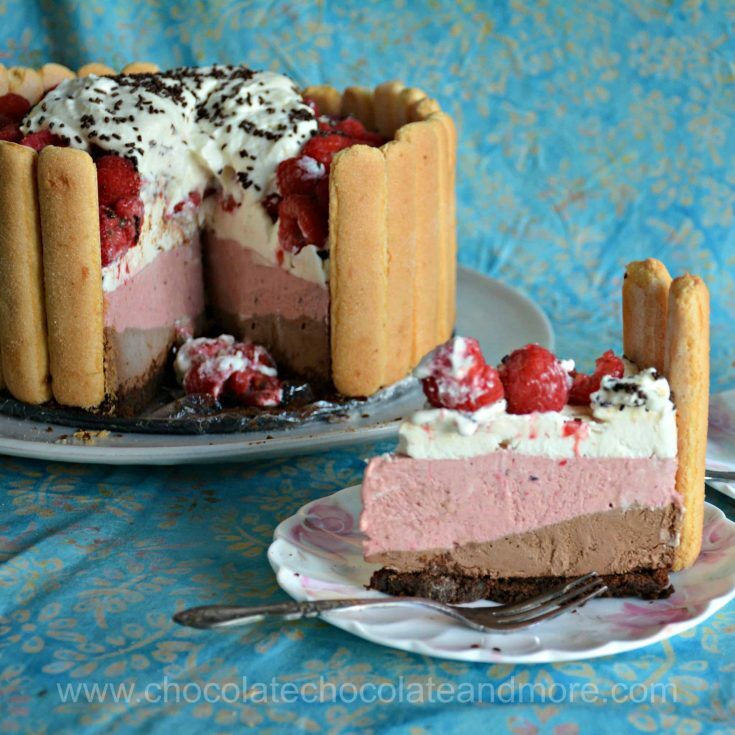 I froze my easy chocolate raspberry charlotte because everything just melts in the heat here. This freezes well so you can easily make it ahead. You can also serve this frozen. Everyone will think it’s an ice-cream cake. Personally, I think it’s nicer thawed because you can taste the flavors better. Line a 9-inch cake pan with parchment paper. Grease lightly with oil and dust with cocoa powder. Beat egg yolks and sugar until pale and thick. Mix in chocolate. Beat egg whites until stiff peaks form. Fold into chocolate mixture and pour into prepared pan. Bake at 400°F for 10 - 12 minutes. The top should feel springy to the touch. Let cool for a few minutes and then use a knife to loosen the edges before inverting onto parchment paper. Line a 9 inch springform pan with plastic wrap. Place the cooled sponge cake in the bottom. Gently lift a small section of the sponge cake up and slide the end of a ladyfinger in between the sponge and the pan. Repeat with lady fingers all the way around the pan. Set aside. Mix gelatin, sugar and flour in a 1 quart saucepan. Whisk in egg yolks and milk. Turn heat on to medium and cook, stirring, until the mixture thickens and coats a spoon (about 10 minutes). Break the chocolate bar into pieces and place in a bowl. Pour half of the hot custard over the chocolate bar. Stir until the chocolate melts and everything is mixed. Add the raspberry jelly to the other half of the custard. Mix thoroughly. Cover the custard with plastic wrap laying the plastic wrap directly on the surface of the custard. This stops a film from forming on the top. Refrigerate until cool (about 30 minutes). Place a metal mixing bowl and beaters in the freezer for 10-15 minutes. Add well-chilled whipping cream to the bowl and beat until stiff peaks form. Fold half of the whipped cream into the chocolate pastry cream. Fold the other half into the raspberry pastry cream. Pour the chocolate pastry cream into the prepared pan. 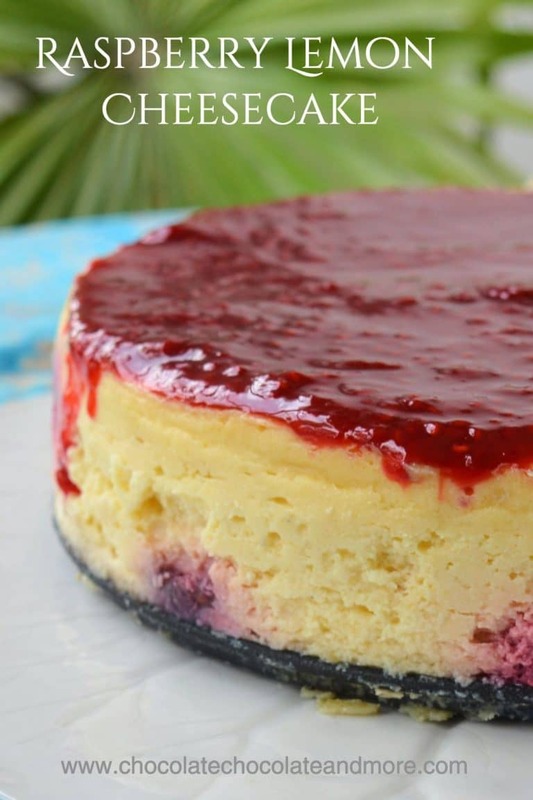 Gently pour the raspberry cream on top. Refrigerate or freeze while you make the stabilized whipped cream. Put the mixing bowl and beaters in the freezer for 15 minutes. Put all ingredients in the bowl and whip until stiff peaks form. Spread on top of the cake. 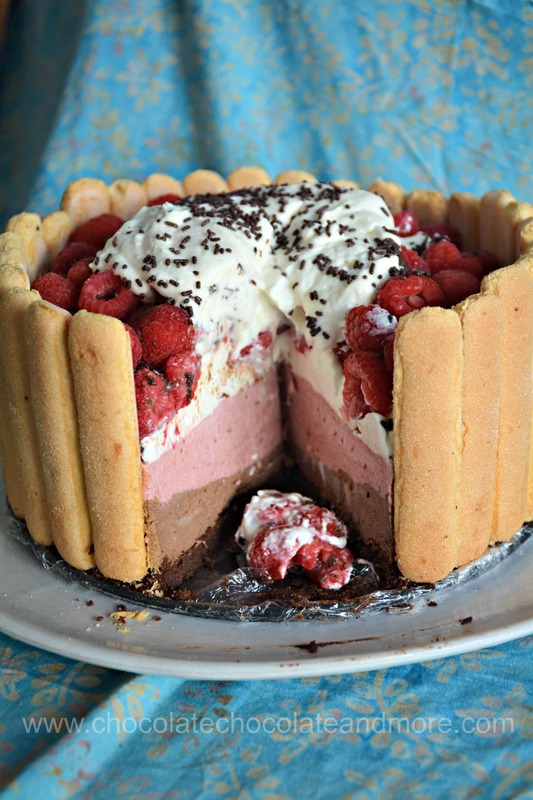 Top with fresh raspberries and chocolate sprinkles. Refrigerate or freeze until serving. Looking for more great desserts? Sounds good and I’ve always wanted to try to make one. Can you substitute strawberry jam for raspberry? I am not a fan of raspberries. Yes, you can substitute any flavor jam you’d like. Strawberry would be great or cherry.